Android fans will find a Google Fit software update waiting for them, and those who have an Android Wear watch will get a little something extra with the app: An experimental feature for offline support. The latest version of Google Fit on the phone has your typical bug fixes but also the ability to start tracking many more activity types. The idea behind [company]Google[/company] Fit is to just let the app passively collect activity data during the day by using your phone’s sensors or some other wearable device. To that end, it’s been a bit a fail for me, as evidenced by this amazing day last month, where the app says I was running for nearly 76 hours — in one single day. What can I say: I’m an overachiever. 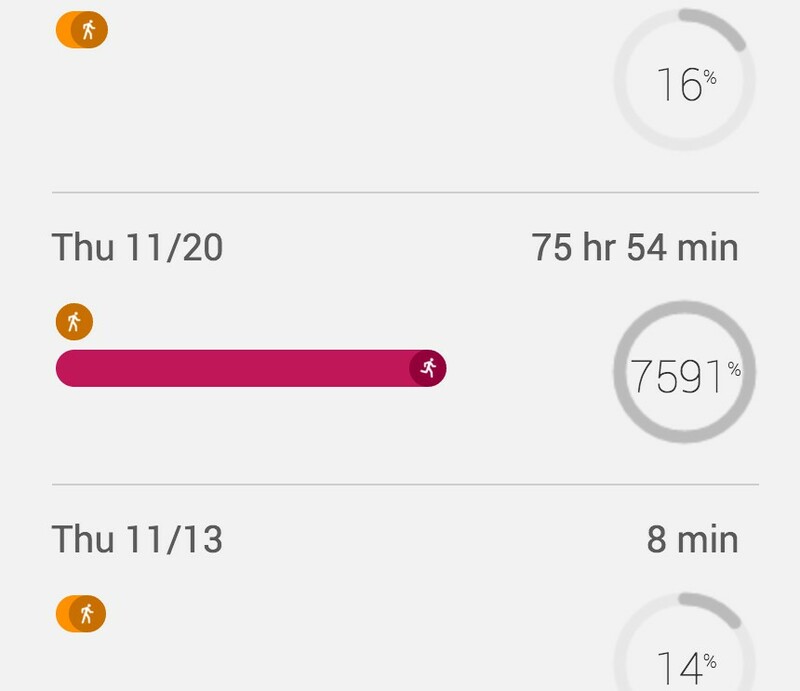 Personal (and outrageously inaccurate) records aside, the newer software lets you manually track up to 100 different activity types in Google Fit now. You could say that defeats the purpose of an automated app that should be smart enough to know what you’re doing, but I still see value here. There are times when it’s not feasible to carry a phone while you’re active — when you’re swimming laps, for example. The updated app allows for this manual entry with activities ranging from Australian Football to Zumba. The feature to use an Android Wear device for step detection when the smartwatch is disconnected from a phone is new and experimental. I’ll have to try it this weekend to see if I can top my record from November. How are you finding the step counter on the Sony? I read a review of the Asus watch on Engadget which claimed both heartrate and step tracking were unreliable. (I think that’s where I read it). Anyway – event logging like this makes a lot of sense. No matter how well your sensors work you can only guestimate just so much what the activity might be. What it really should have is the ability to enter custom activities with custom data points to track. Maybe I’ve inented my own game or activity and I want to keep track of how many xyzs I made that day or how long I spent doing xyz or what limit of xyz I reached. Or some combination of the above.